With the first trimester underway, there’s no denying we have had to adjust to the changes. Between unprecedented circumstances, and the bumps that naturally come with a new staff and new administration, I am proud to say that we have held together as a community. First and foremost, we have to always remember that at the end of the day, the students are our priorities, and that no change – regardless of how small – can be remedied overnight. Despite some of the hiccups, our classes are as busy as ever, inspiring me to take a step back and reflect upon all the good that’s happening around us. Yesterday started with the Kindergarteners reviewing the parts of the calendar, the days of the week, and most importantly, a reminder that Halloween is a week away! From trips to Sesame Place to weekend road trips, the unconditional love that our parents show to our students exudes through their excitement and enthusiasm. To spark the spooky season, the Parent Academy Association volunteers, along side additional father volunteers, put together a fantastic Halloween Haunted House for the school to share scares together that some of the students were still boasting about to this day. As I made my way through the hallways, I was moved to see that the 1st and 2nd grade classes were working together, not on a project, but on something much more important – fire drill procedures. Earlier in the week, teachers were informed that we would be beginning our fire drills, which staff was prepped for back in September. Mrs. England and Mrs. Palladino decided to join forces and have their students working with one another to ensure that they had an organized, and well-oiled procedure to get everyone out the door and to safety expeditiously. With the joint efforts of our faculty, staff, and the precautionary attitude of the students, we were completely evacuated within 1 minute and 32 seconds! The highlight of my week, however, was being with the 4th graders in their music class. As a former canter and musician myself, I had a moment to relive some of my favorite times as a student: singing God’s word – and from a teacher’s perspective: overcoming difficulties as a team. The students and I had such a great time working together to master the melody, to gain confidence to sing solo verses, and learning that everyone makes mistakes – even adults! There are so many other exciting things going on within these walls! 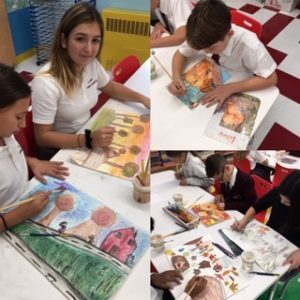 Just to name a few: the 6th grade TAC class is working on their digital family portraits composed from a genetics project that stems from their science coursework, and our 8th grade art students are working on animal sketches to help hone their artistic skills. I’m extremely grateful and proud to be a part of it all! Thank you all for your support and prayers for the continued educational success of your children. I can’t wait to see what other exciting happenings we can be a part of together!